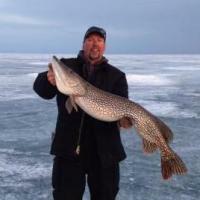 It seems like every time I went fishing this winter it was a different distance from the top of the hole to the ice. I would build a set of hole sleeves and they would either be to long or to short, so I ended up building 4 different length's, built some 9" today. I use the wide mouth 5 gal buckets from the local bakery at 1.00 ea, I cut the very upper ring off and then put 2 wraps of Foam Tape Weatherstrip, 1/2" 3/4" wide x 17' long just under the bottom ring so it fits tight in the hole. The finished sleeve costs about 2.00 ea and works great as long as it reaches the ice, or close to it. I guess Im a little slow at times, but that's why I love this forum with all the great ideas that the members share. I will use your advise, and I believe that will solve my problem. I prefer the sleeves to be an inch or so too long on top giving each hole a border from accidentally kicking things down. Another tip is to use white sleeves to help illimunate the light better.